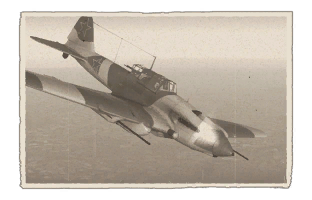 The IL-2-37 is a Rank III Soviet attacker with a battle rating of 3.3 (AB/RB) and 3.7 (SB). It was introduced in Update 1.70.1945 "Weapons of Victory". The IL-2-37 is the slowest of all of the extended-cockpit IL-2 variants (those featuring a gunner). As such, the IL-2-37 should be played as an attacker and only as an attacker. Anything else will get it destroyed very quickly. The IL-2-37 is meant for swooping down and taking out tanks with it's dual 37 mm NS-37 cannons. It does a fairly decent job at doing so, it is recommended to dive at a high angle and shoot the top of the tank to set them on fire or kill the crew. 6 mm Steel plate behind propeller. 4 mm Steel plate covering the front fuselage. 12 mm Steel plate in air intake. 6 mm Steel plates around the oil cooling system. 5 mm Steel plates around the fuel tank. 6 mm Steel plates surrounding the cockpit. 64 mm Bulletproof glass in cockpit front. 4 mm Steel plate above cockpit fuel tank. 12 mm Steel plate separating cockpit and rear gunner. 6 mm Steel plate in front of the rear gunner. Being a true attacker, it should head straight to its target immediately as the battle starts. The gunner is extremely powerful and accurate even before upgrades, it is not uncommon to get three or more gunner kills in one game. Take advantage of the fact that many enemies will approach the aircraft from straight behind, so switch to gunner view and just aim for the cockpit of the enemy plane attacking the tail. Use the Armoured targets belt for the gunner, as they feature a cement-core round capable of penetrating through most bulletproof glass, engine casing, and armour. The IL-2-37 comes with a pair of 37 mm guns, each with 50 rounds loaded. In tank battles, dive from above and attack targets through their more vulnerable roof. In air battles, come from the side or back as enemies are usually travelling in a straight line. Set a gun targeting distance of no less than 500 m so the IL-2-37 can pull out of the fray once it passes over. When the enemy is in sights, fire once and see if the shots hit and kill the target. If it doesn't, fire again, and pull out of the engagement if the target was not destroyed in the two volleys. Go around for another pass or focus on a new ground target in the IL-2-37's flight path. Referred in the west as the "IL-2 Type 3M". Based on the two seat Il-2, armed with Nudelman-Suranov NS-37 in conformable gun pods under the wings, instead of the 20/23 mm cannons, this version is an attempt to create an anti-tank aircraft, first used in combat during the Battle of Kursk. However, the combat effectiveness was quite low and production of the variant was limited to about 3,500. Moreover, bomb load was decreased from 600 kg to 200 kg. It was replaced by the conventional Il-2 attackers armed with cassettes with cumulative bomblets. 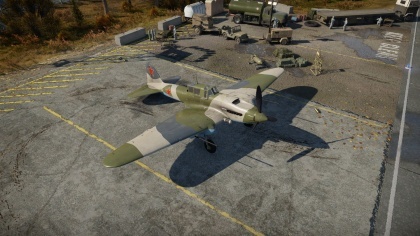 Skins and camouflages for the IL-2-37 from live.warthunder.com. This page was last edited on 8 January 2019, at 17:00.